If you ever wondered the need of owning Dehumidifier, then this article will give you the answer. It is essential to maintain a proper humidity level in your room for various reasons. There are many disadvantages of having excess and low humidity. The environment in your house can be damaged and your expensive items can be affected by humidity. To protect your expensive items from humidity damage, you need owning Dehumidifier. A dehumidifier efficiently and reliably protects your home and health, indeed, a dehumidifier always acts as a friend. Too high or low moisture creates bad stench in the environment, which apparently creates a bad vibe around you. Musty smell more often lets down people and makes them uncomfortable. A Dehumidifier immediately filters out the bad smell and vents out dry air by which the environment in your room is refreshed. If you have kids or infants in your home, it's important to keep their lives healthy. A dehumidifier gives a sounds sleep to your kids and avoids them from getting affected by the moisture problems. Even when you are drying out your wet clothes in your room, you usually face the problem of smell and the clothes take time to dry. This creates moisture in your room also leading to serious problems such as mold and so on. With steam rising up, the bathroom area often gets affected by molds. The dark spot on the ceiling or corner of the bathroom wall suggests that the environment is affected with moisture. Bathrooms need to have an exhaust fan to let the steam and humidity out. Even a damaged pipe can cause serious problems with dark spots around making you uncomfortable. The mold on the ceiling of the bathroom damages the house and grows as an ugly spot. You can see when there is high humidity, your window gets condensed, with water beading on it. Certainly, this looks normal to us, however it is bad for the indoor environment. This mist on the glass indicates that humidity in the environment is high and the wooden goods and expensive items are more likely to get damaged. The outdoor environment could also impact the condensation, due to rain or fog. To avoid such problems, you can use a dehumidifier. The dehumidifier quickly removes all the moisture and keeps the environment safe and fresh. Too much humidity leads to unpleasant air. If the environment is humid, it’s certainly bad for health as the humid environment creates the flow of bacteria, dust and so on. The unpleasant environment then causes health issues by which humans can contract diseases. The problems like chapped lips, furniture damage and musical instruments damage are due to excess humidity. High humidity is a threat to your house or office. Expensive items get damaged easily. The easiest way to escape from the moisture problem is by using a Dehumidifier. 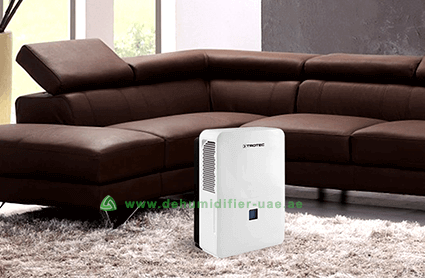 Dehumidifiers come in different ranges with different dehumidification capacities. To choose the right type of Dehumidifier for your required dehumidification capacity, Vacker Global supplies all types of Dehumidifier for Domestic, Industrial and Commercial environments. Comfort Dehumidifier with stylish design efficiently removes moisture from your room using advanced technologies. With a dehumidifying capacity of 50 liters per day, this dehumidifier clears out all the moisture, air pollutants, dust and unpleasant smell and keeps your environment fresh and clean.